Korea Handmade Fair is the original of handmade fair in Korea. The only cultural festival both for artists and the public has been held at COEX, Seoul since 2011. 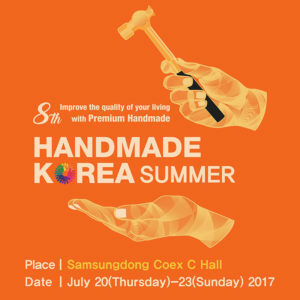 Starting from 2016, Handmade Korea takes place twice a year – summer and winter season, respectively. It’s the offline platform that connects the public and artist throught handmade, art and performance. The latest Korea Handmade Fair record 38,704 visitors from buyers to community with 353 exhibitor in 513 booths. This year handmade artist and brand participated from eight Asian countries including Japan, China, Taiwan and Hong Kong. The fair seeks to provide an opportunity for artists to develop commercial products and explore sales channels, and for the public to see and experience artworks and have easy access to artistic products applying pieces of artwork to their daily lives, while playing as an incubator that helps artists, start-ups and small enterprises by providing various services such as online, design related laws mentorship and buyer matching. The fair helps professionals and amateurs alike to give opportunity for growth by sharing their unique artistic works with the public. At the upcoming summer edition, anyone to appreciate and buy a variety of handmade items from unlimited genres covering art&illustration, living interior, fashion, beauty, reform, hobby, DIY class, homemade food & gallery café and quilt, children and pet.